This is an entertaining, enchanting, humorous and mind-boggling introduction to the Discworld. You can tell this is an early work from Pratchett - the writing isn't as good as newer works and the Discworld is still a work in progress. But this is still a lovely entertaining book. 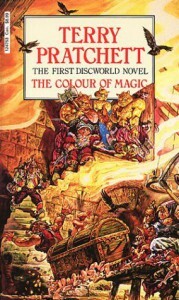 In this first Discworld novel, an ineffective wizard (Rincewind) that is very good at surviving, a naive tourist (Twoflower), and his many legged luggage (made from sapient pear wood) have many adventures with such things as the "fascinating" denizens of Ankh-Morkpork, dragons that only exist if you believe in them, barbarians, trolls and the edge of the Disc. This book ends on a cliff-hanger so having the next book (The Light Fantastic) at hand is recommended. The cover art of my old much-loved paperback has the delightfully crazy art of Josh Kirby. I also listened to the audio-book, which I found well paced and nicely presented.